The Bible tells us in Psalms 24:1 The earth is the Lord’s. As God’s greatest creation, we are lent the earth during our lifetime. Because of this, we will be held accountable to God for our use of His possessions. The money God allows us to have is included in this accountability. Many Christians have no problem when it comes to God’s money, other however, seem to find money as a major testing ground of their faith. The problem arises because of not knowing the Bible where giving is concerned or because of not fully surrendering possessions to the Lordship of Christ. 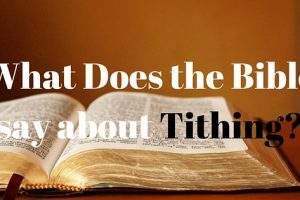 So what does the Bible say about Tithing? The tithe is our way of honoring God. Proverbs 3:9-10 “9) Honor the Lord with your possessions, and with the first fruits of all your increase; 10) So your barns will be filled with plenty, and your vats will overflow with new wine. The tithe belongs to God. Abraham paid tithes to God. Genesis 14:8-24 (verses 18-20) 18 Then Melchizedek king of Salem brought out bread and wine; he was the priest of God Most High. 19 And he blessed him and said: “Blessed be Abram of God Most High, Possessor of heaven and earth; 20 And blessed be God Most High, Who has delivered your enemies into your hand.” And he gave him a tithe of all. Tithing is a means of obeying the Words of Jesus. Tithing provides financial support for the local church. Malachi 3:8-12 8 “Will a man rob God? Yet you have robbed Me! But you say, ‘In what way have we robbed You?’ In tithes and offerings. 9 You are cursed with a curse, For you have robbed Me, Even this whole nation. 10 Bring all the tithes into the storehouse, That there may be food in My house, And try Me now in this,” Says the Lord of hosts, “If I will not open for you the windows of heaven and pour out for you such blessing that there will not be room enough to receive it. 11 “And I will rebuke the devourer for your sakes, So that he will not destroy the fruit of your ground, nor shall the vine fail to bear fruit for you in the field,” says the Lord of hosts; 12 “And all nations will call you blessed, for you will be a delightful land,” says the Lord of hosts. We determine the amount of our increase from God. Our tithing sets up an account with God. God materially blesses the Tither. God eternally rewards the Tither.